So you’re seriously thinking about taking out a title pawn. You’ve heard that these loans are a quick way to get some extra cash, and so far it looks like the best option since you need to come up with a couple thousand dollars by the end of the week. Before you nosedive into getting a title pawn, here are some answers to a few lingering questions you may have about the title pawn process and how these loans work. Rather than using one’s credit score to secure a loan, with a title pawn, the borrower uses their vehicle title as collateral in exchange for a loan. In addition to a title pawn on a car, some lenders also offer loans up to $15,000 on other vehicles without titles including ATVs, motorcycles, boats, RVs, commercial vehicles, construction equipment, landscaping equipment, logging equipment, and more! How do title pawns work? Title pawns are usually for a 30 day term and borrowers must repay the loan balance in full plus the interest in order to redeem their title. Within the 30 days, the borrower can redeem their title by paying the balance in full or he or she may renew the loan by paying at least the minimum interest due. The borrower can pay more than the interest due to reduce the principle balance. This will save you money on future interest, so it is a good idea to pay more than the interest only if you can afford to. If the loan is renewed, the borrower will receive an additional 30 day term and interest will be charged on the remaining principal. There are many benefits to getting a title pawn as opposed to opting for a cash advance loan or a pawn loan. You can usually borrow more money and at a lower interest rate than a cash advance or pawn loan. You keep your car, while with a pawn loan you have to leave your collateral in the pawn shop’s possession. Get same day approval and walk out with the cash you need in often less than 30 minutes. Additionally, title pawns are not credit based loans, so if you have bad credit or no credit, then that will not be a problem when applying for this type of loan option. It also will not impact your credit score if you can’t make your payment on time, or even worse, if you can’t pay the loan back at all. Your credit standing with the lender will be affected, but not your credit score at the credit bureau. You are putting up your car as collateral for a loan even though you are only leaving your title with the lender. So, just like at a bank or credit union, if you don’t pay your loan back as you agreed in your contract, the lender will most likely repossess your car. This is why it is important to contact the lender if you are going to be late making your payment. They will usually work with you if you are open and honest with them about your situation. It is best to be sure you can make the payments on time before you even take out the loan. The loan limit and requirements may vary depending on your state of residence. For example, in Alabama some lenders may offer up to $15,000 while others may offer up to $20,000 on title pawns with varying rates. When you’re ready to get started with a title pawn, you’ll need to bring the following required items and complete a brief application with your lender. Loan approval and amount are subject to meeting the company’s underwriting requirements and may vary depending on your collateral and ability to repay. Getting a handle on your finances takes time, and Quik Pawn Shop understands. For nearly 40 years, customers have trusted Quik Pawn to provide them with affordable short-term loans to meet their immediate needs, and so can you! If you’re in a jam and need immediate help, any of Quik Pawn Shop’s loan options may be just what you need to get you going in the right direction. 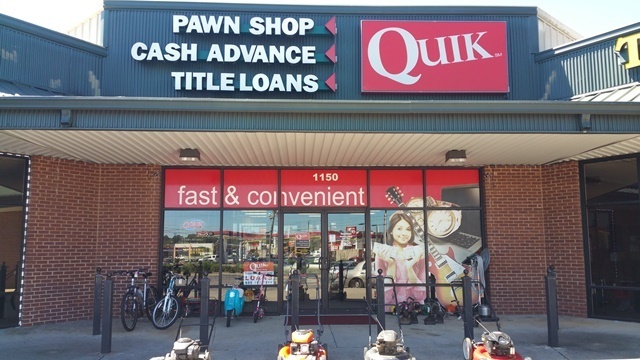 If you have questions about our title pawn loans or if have any questions about our additional loan options, visit www.quikpawnshop.com or call 1-855-402-PAWN (7296) for the help you need today.